Fan Goes Wild After ATL Concert!!! Hot Bods & Jet Skis Jonas Babes Take Miami!!! Sisters-in-Law's Night Out ... 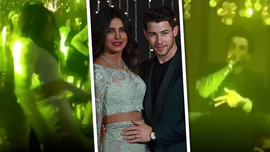 Without Jonas Bros.
One Last Wedding Hurrah (Maybe) ... Shout-Out to Bollywood!!! We're Back In India ... For More Wedding Parties!!! Let's Never Stop Celebrating Our Wedding!! !